There’s a branch of desi food that has never received attention. Actually, it isn’t so surprising when you consider how much leg-work the research would involve: How Indian food has traveled beyond our shores. 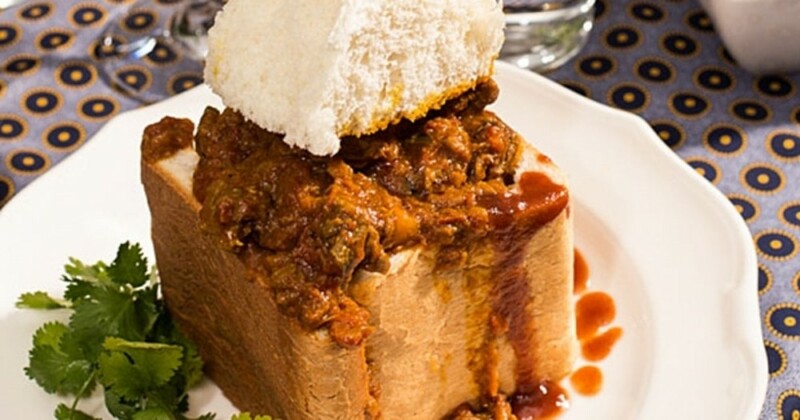 So if you go to Trinidad and Tobago, you’ll find buss up shut; go to Malaysia and every last food court has roti canai and go to South Africa and you’ll get to sample bunny chow. Now here’s the inexplicable part: none of these dishes exist inside India, at least not in their present form. I would have never got to hear of buss up shut had it not been for Chef Manu Mohindra, consultant chef for restaurants all over the country. I spied it on the menu of one of his client’s restaurants and was intrigued by the name. I did put it down to a maverick chef’s sense of humour, but it turned out that a community of Indians who left, centuries ago for Trinidad and Tobago, made chicken, goat or potato curry with a fairly thick gravy, poured it into a double fold of roomali roti and folded it over neatly so that it became a perfect triangle – just like a sandwich. Since then, I’ve heard about the dish, which seems to be the local equivalent of a hamburger on the islands of Trinidad and Tobago. It’s the ultimate meal-on-the-go, eaten piping hot with a can of chilled beer. A café in Noida had another one of Chef Mohindra’s trump cards. 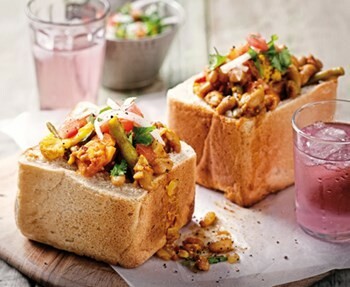 This one was in the sandwich section and was called bunny chow, which I immediately put down to a chef’s pranks. In response, I was solemnly handed a book called Curry by Lizzie Collingham, in which she has documented the origins of bunny chow. Apparently, it is a perfectly bona fide dish, more or less invented by the Indian community of Banias who had settled down in South Africa. They weren’t allowed to open restaurants because of the apartheid law, but because nobody said that they couldn’t sell food at all, they hollowed out loaves of bread, filled them with curried mince, put the tops on again and sold these meals-on-the-go until it has become a dish recognized in its own right. Collingham hypothesizes that ‘Bunny’ is probably a corruption of Bania, but my mind boggles at the thought of a strictly vegetarian community making their living selling meat! Another theory, however, has it that the Borah Muslim community, primarily from Gujarat, were called Bania/Bunny, but the reason is obscure. 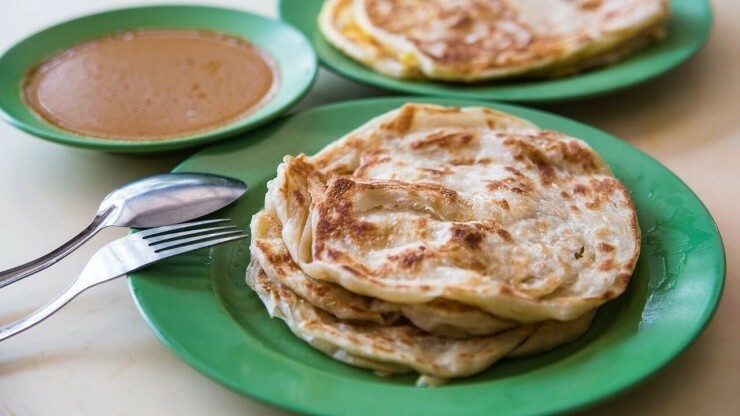 Any visitor to Malaysia and Singapore would be familiar with roti canai and roti pratha. That they are the preserve of Indian settlers to the Straits in times bygone is clear because even today, it is the people of Indian origin who run the stalls. Roti pratha is a glorious, lacy paratha, the likes of which I’ve yet to encounter in India. 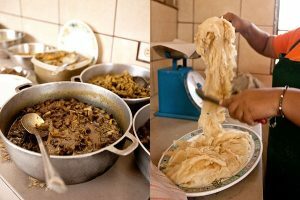 Roti canai is a meal consisting of a refined flour, flaky, fluffy paratha that is eaten with a curry that contains elements of South India (kari patta) as well as South East Asia (lemongrass). It’s available in restaurants and street stalls all over Malaysia, but is hardly heard of in the supposed country of its origin.